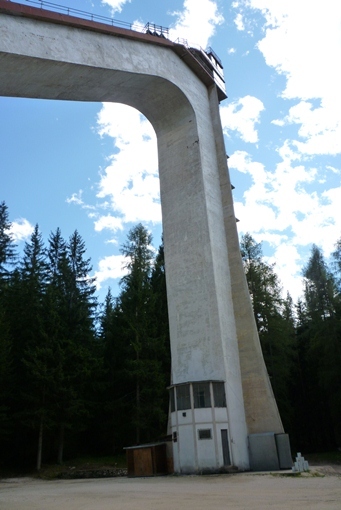 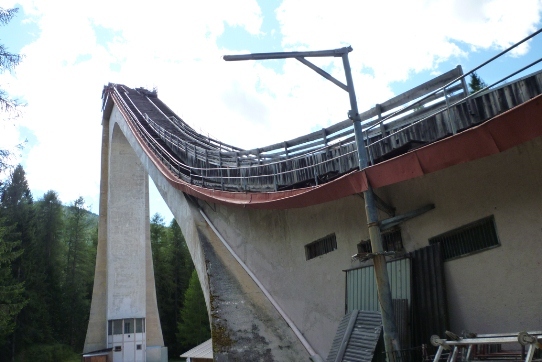 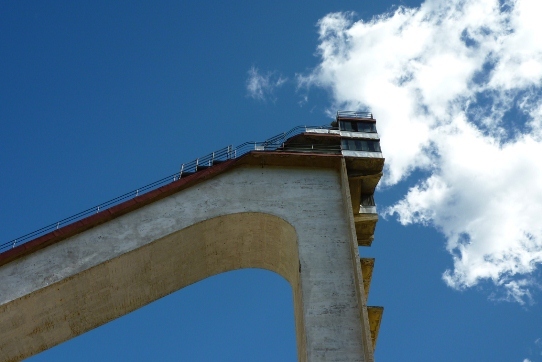 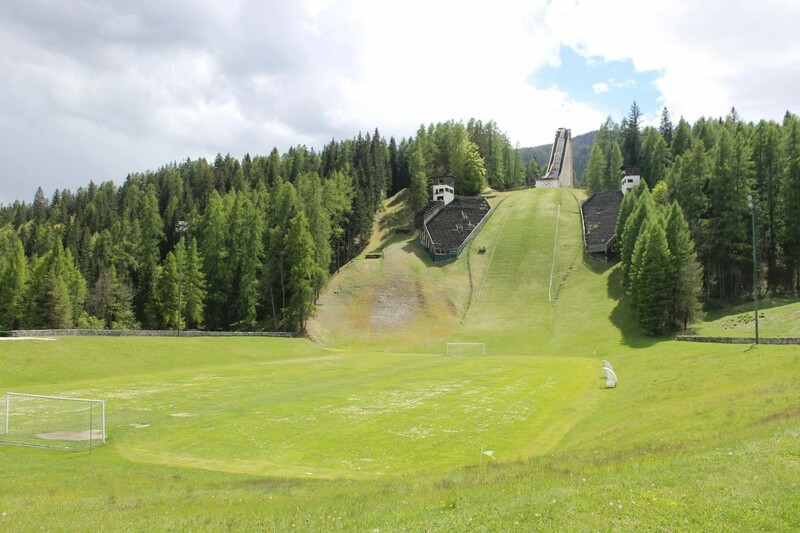 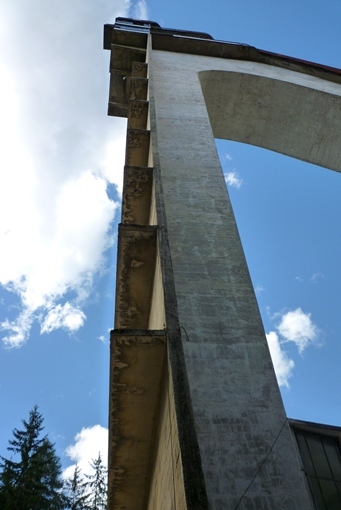 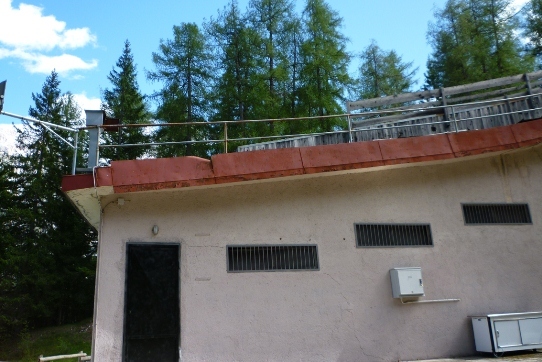 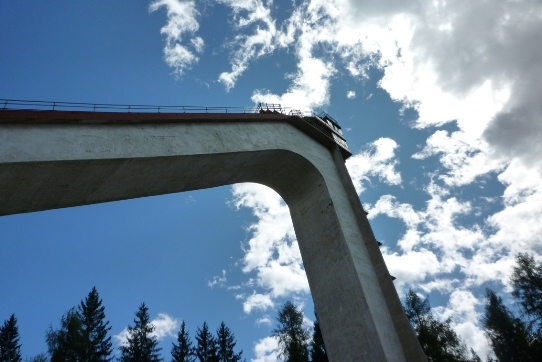 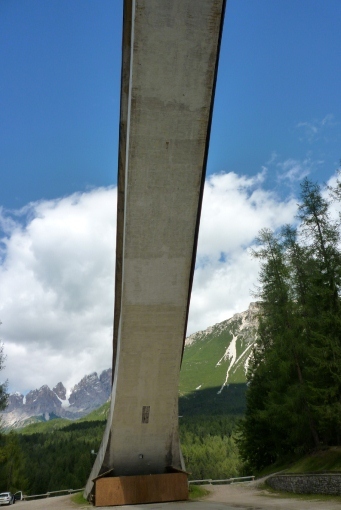 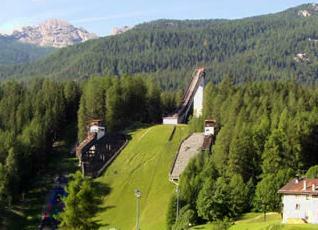 The history of the ski jump leads back into 1923, because in this year it was built as the “Franchetti-Schanze” at Zuel, a suburb of Cortina. 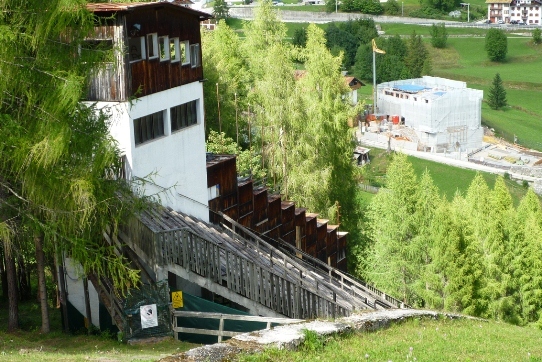 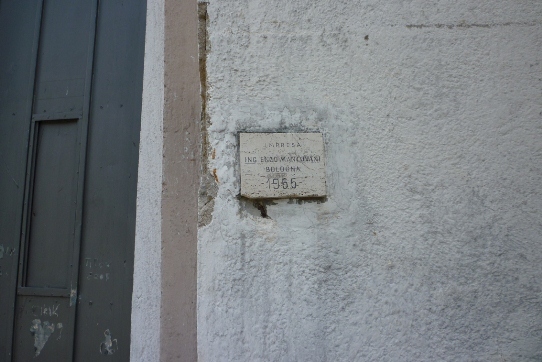 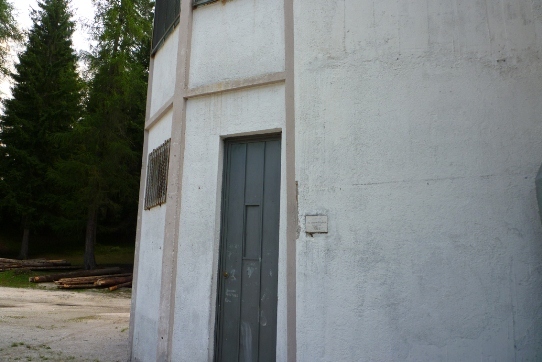 It was named after the hotel owner and financial supporter of the construction of the jump. 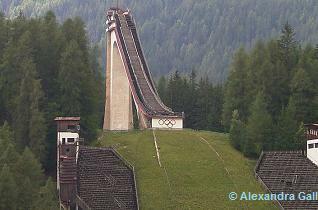 In 1926 the jump was enlarged and jumps over 50 m were possible. 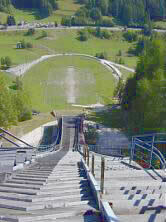 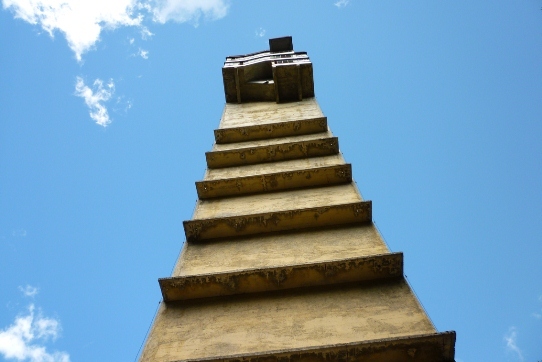 In 1939 the destruction of the jump followed, because it did no longer fit with the risen international standards. 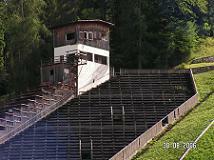 In the following summer the reconstruction for the World Championships in 1941 took place. 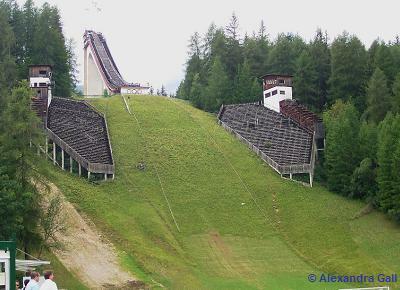 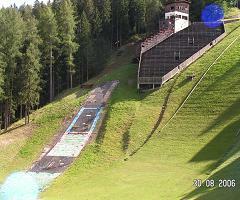 On the new Italia ski jump, which had a 48 m high wooden inrun tower, the 20 year old Sepp Weiler from Oberstdorf jumped the largest distances including a hill record of 76 m and was already celebrated as the World Champion. 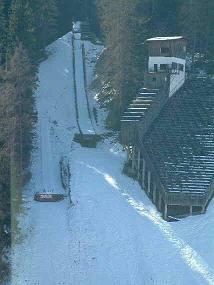 But he just finished 4th place. 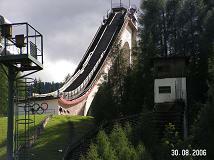 Policies played an important role and the judges gave marks for the “German” which were much too low. 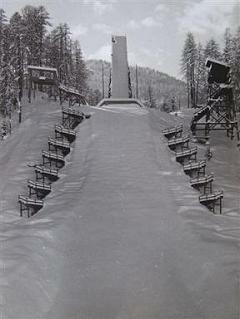 Later this WSC was negated because of the war. 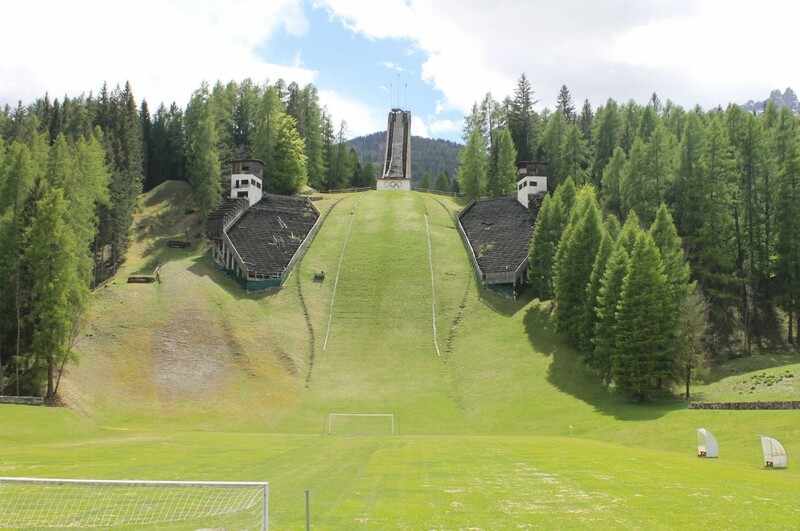 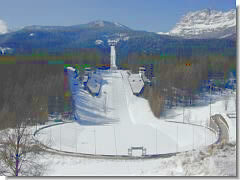 The last hill record on this ski jumping hill was performed by Finland’s Laaksonen with 78 m.
For the Olympic Winter Games 1956 a complete new construction of the hill was needed and on December 8, 1955 the official opening of the most modern ski jump worldwide at that time took place. 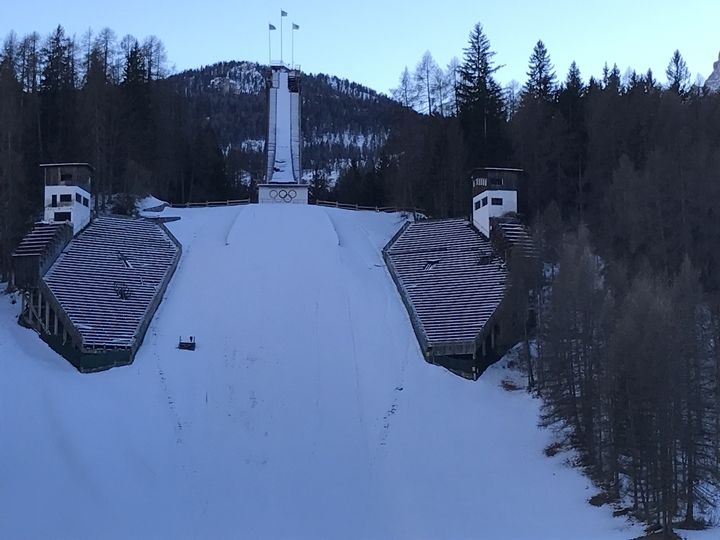 The Olympic ski jumping competition was won by Antti Hyvarinen (FIN) with a record of 84 m. In the following years many national and international competitions took place. 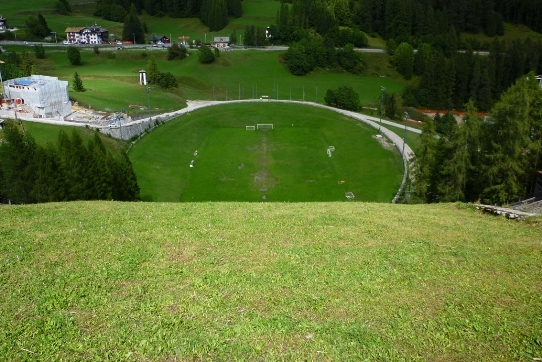 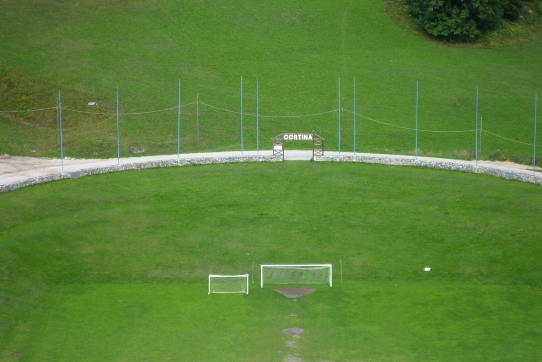 Just as the first World Cup competition ever which took place here in 1979. 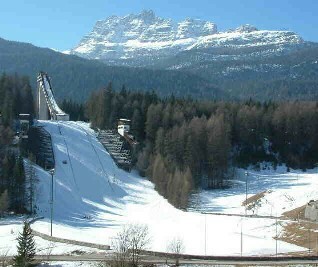 The FIS certificate for international competitions of the jump was only valid until 1990 and afterwards the Italian Ski Federation didn’t manage to convert the jump and since ski jumping has been stagnating. 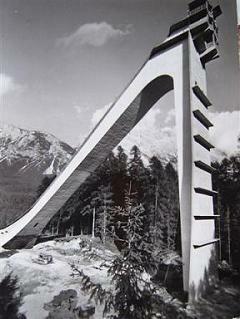 Still today the facility looks like an amphitheatre and the powerful steel-made inrun tower, the spectator places and judges towers are witnesses of the technical construction performance of the architects Reinhard Straumann and Guglielmo Holzner from Bolzano (Bozen) and Enzo Mantovi, Luciano Berti and Piero Pozzazi of the Engineering School of Bologna. 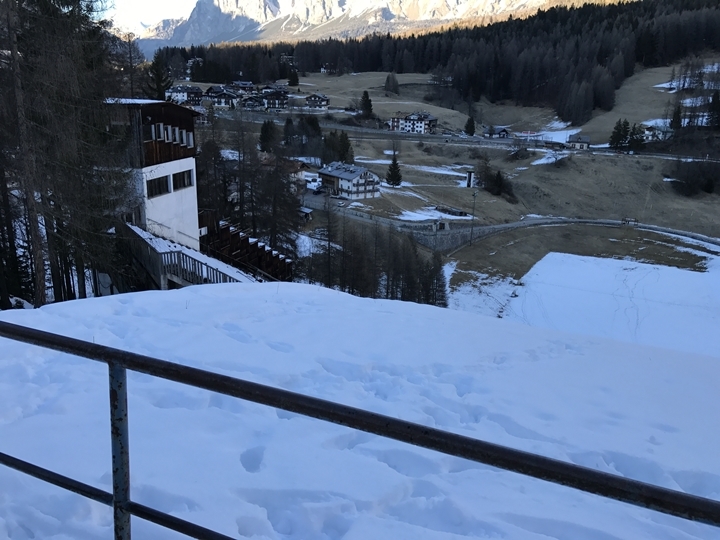 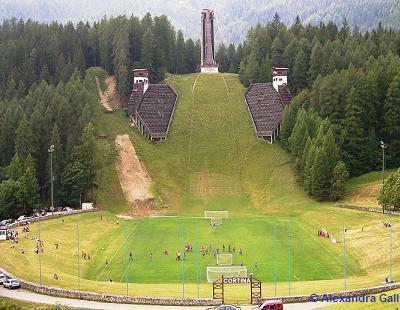 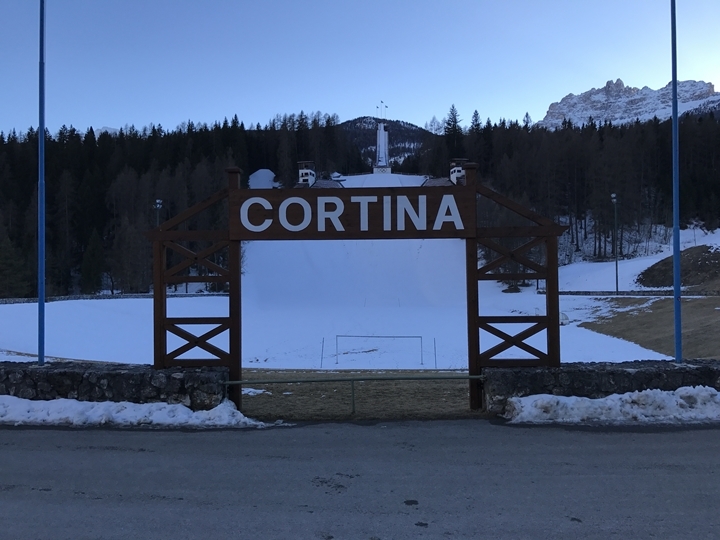 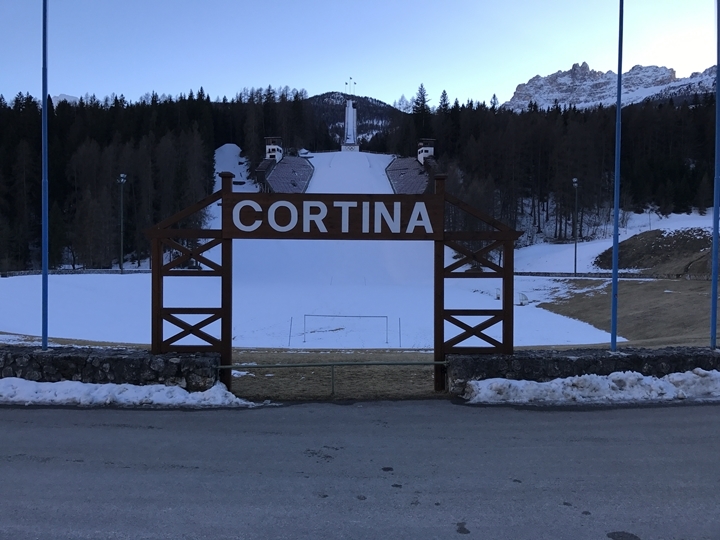 The last episode of the first season of our column "Luis on Tour" stops at the former Olympic ski jumping hill at Italian Cortina d'Ampezzo. 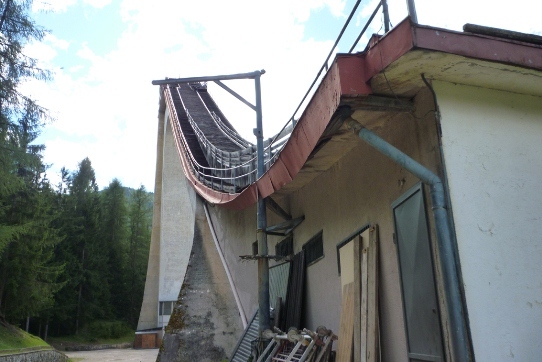 Ich habe bei einem Dolomitenurlaub heute die Olympiaschanze von 1956 besucht, um den Ort des Medaillensprungs von DDR-Idol Harry Glas einmal live zu sehen. 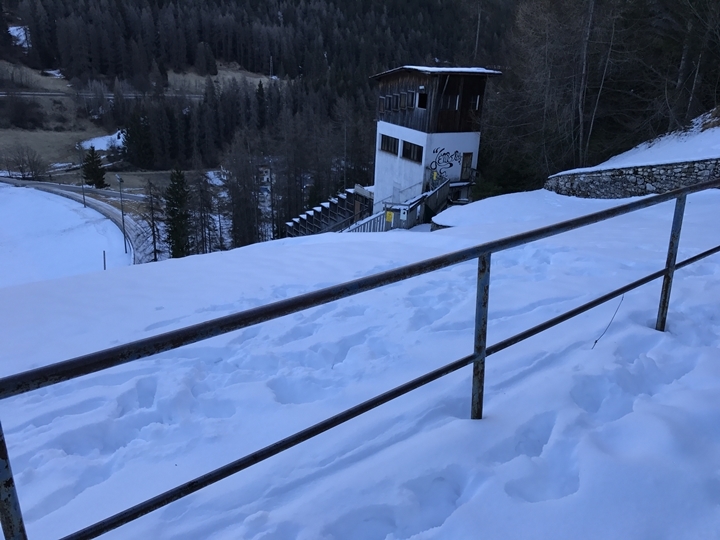 Es ist traurig, wie der einstmals schöne Bakken dahinsiecht. 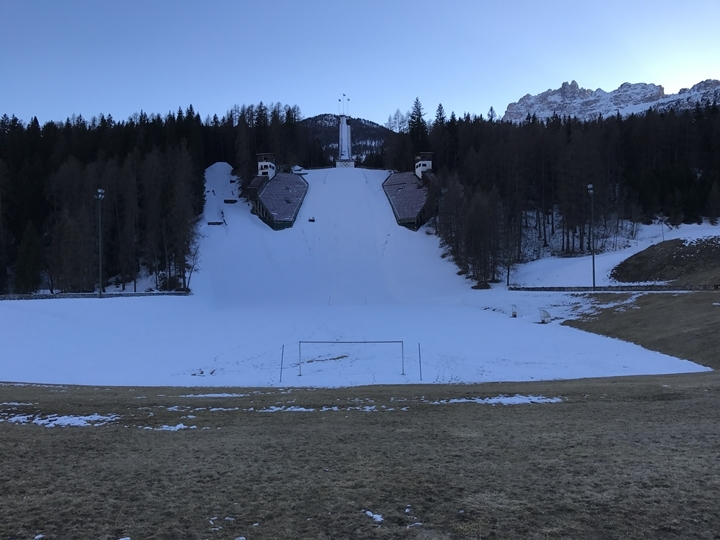 Vielleicht wird ja das Skispringen in Italien wieder einmal so populär (und finanzierenswert) wie zu früheren Zeiten!? 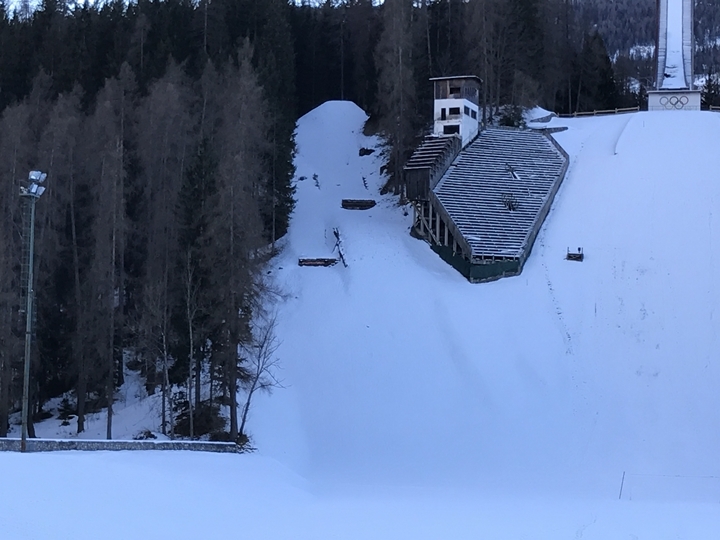 Da kann ich meinem Vorredner nur zustimmen. 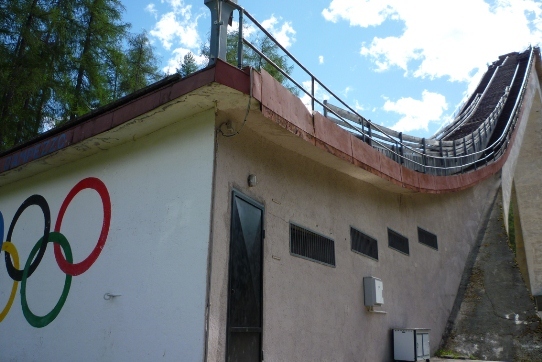 Das schmerzt einen Sprungfan bis ins Mark, wenn man solche tollen Anlagen verfallen sieht. 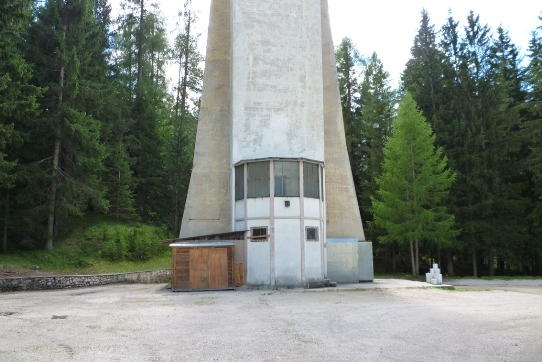 Warum schaffen die Italiener es nicht, diese wunderbare Anlage wieder auf den neuesten Stand zu bringen? 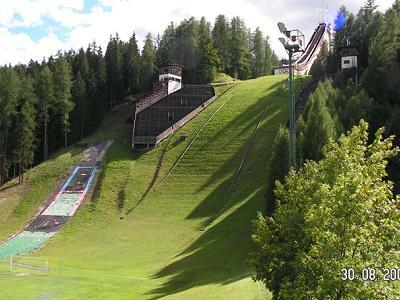 Dann könnte man auch auf Harrachov oder Kuopio verzichten. 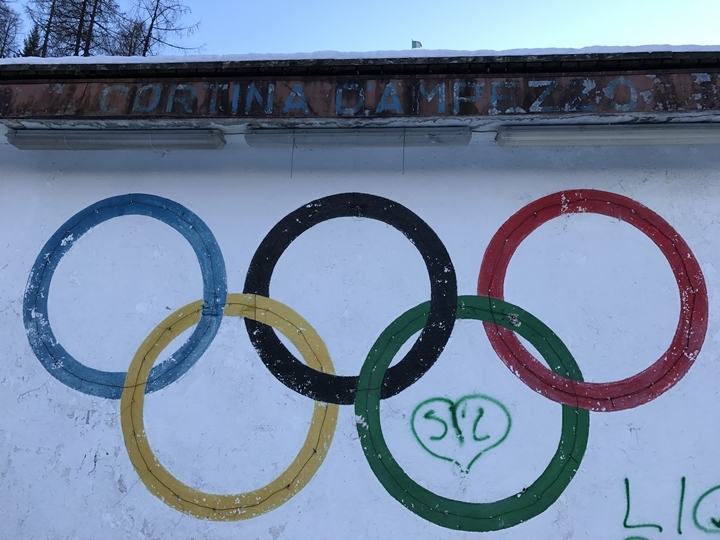 Ja, James Bond ging über die Schanze. 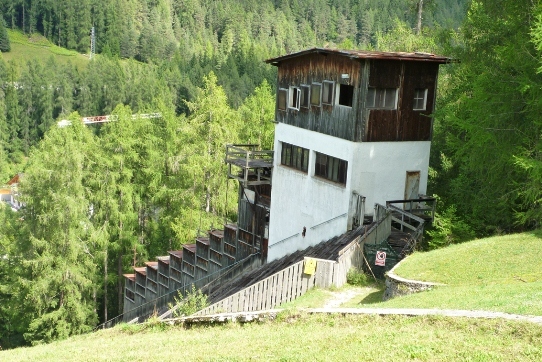 Lese gerade das Buch von Matti Nykänen "Grüsse aus der Hölle" und habe gesehen, dass Matti zwei WC-Springen in Cortina gewonnen hat und somit auch schon hier war. 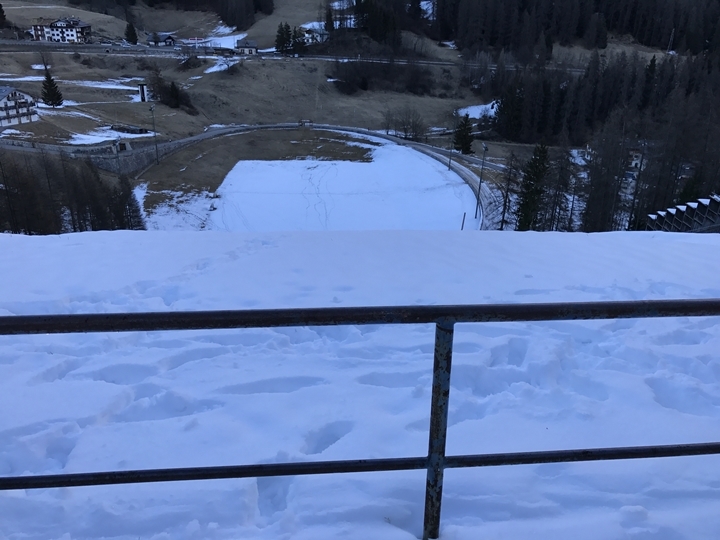 Das Buch kann ich jedem Skisprung-Fan nur empfehlen. 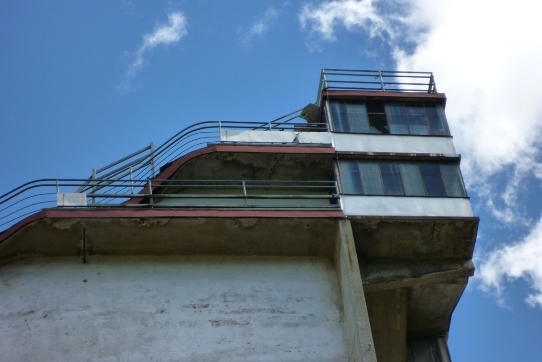 Diese Schanze war Schauplatz im James Bond-Film "In tödlicher Mission" im Jahre 1981.